Ó Gallchobhair- anglicised widely as Gallagher, also Gallaher. Woulfe in 'Sloinnte Gaedheal is Gall' (19230 gives the root as 'foreign help' from Gall or 'stranger'. 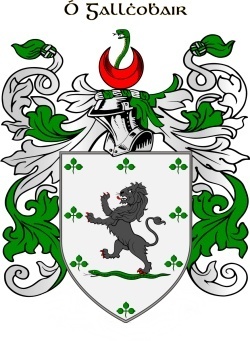 Descended from Maolchobha, the King of Ireland (642-654), they were a leading family of the Cinel Conaill; early established in Tirconnel, their territory spread over the baronies of Raphoe and Tirhugh in the modern Co Donegal. They were a strong military family, and played a powerful role in the forces of the O' Donnells through 1400s to 1600s. A translation from the Irish for their name, gallchobhair (foreign help), was possibly acquired in the 3 centuries when they were marshalls in the armies of the O' Donnells. They excelled as ecclesiastics throughout the late medieval to the early modern period, providing a line of bishops of Raphoe and Derry, and other clergy in Co Donegal and adjacent Co Derry. The Gallaghers, one of the principal septs of Donegal, are still very numerous there. In fact, statistically they were 14th in the list of most common names in Ireland, compiled after the Registrar's Report on Births of 1890. Tirugh Barony, O Gollogher 26 (families); Boylagh and Bannagh, O Gallocher 51; Raphoe, O Gollogher 19; Kill McCrennan Barony, O Gollogher 52; Inishowen, O Gollogher 12. Leynie Barony, Gallaghur 40; Carbry, Gillagher 8. Rossclogher Barony, O Gallagher 15. I found none in the lists for Co Derry, and the returns for Cos Mayo and Tyrone are missing. By the time of Griffith's 'Valuation' (1847-60) the top counties for Gallagher households were: Donegal 1732, Mayo 627, Leitrim 262, Sligo 254 and Tyrone 228. The births distribution from the Registrar's Report of 1890 shows most births in counties Donegal, Mayo, Tyrone, Sligo, Derry and Dublin. Laurence O' Gallagher, Bisop of Raphoe between 1466 and 1477, was cited on the Registry at Armagh for 'incontinence' and other crimes...'quae propter religionis et dignitatis scandalum'. Naughty fellow! Redmond O Gallagher (1571-1601), Bishop of Derry, on the other hand, helped the Armada sailors wrecked off Donegal; had to go into hiding and was subsequently captured and executed by the English. Frank Gallagher (1893-1962) born in Co Cork; he joined Sinn Féin in 1917, and after the electoral victory in 1918, worked with Erskine Childers on the publicity staff of the first Dáil. He was the first editor of De Valera?s newspaper, 'The Irish Press'. Leave a message for GALLAGHER family members. I would like to find out more about my family history. I have information back to Patrick Henry Gallagher of Donegal County and he was born on December 25, 1836. I know that his father's name was Michael Gallagher and his mother's name was Nellie Dwyer. If anyone has any further information on this, I would greatly appreciate it. I need to know about the origin of the Gallagher crest. Any help? Greetings and Happy St. Patricks Day to all. I have been searching for information on my great grandfather James Gallagher. To the best of my knowledge, he was born in Co. Leitrim 1868-1872. On his New York City death certificate it lists his parents as James Gallagher and Bridget McPartland both of Ireland. He left Ireland around 1892 and settled in Brooklyn, New York. He married Anna Woods who was born in Drumkeeran, Co. Leitrim. I have been unable to find any information on my ggf James and would appreciate any help. Thanks. Invite more GALLAGHER family members! Click 'Invite' to connect with more members of the GALLAGHER tribe.